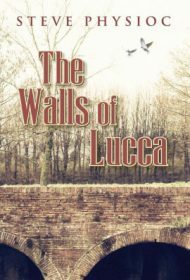 The first in a historical series, The Walls of Lucca is a provoking story of love, war, faith, and forgiveness. Shell-shocked by the Great War and steeped in survivor’s guilt over his brother’s death, Franco Carollo arrives at the struggling Martellino farmyard desperate for work and an escape from his past. There he meets the young orphan Isabella who brings light and laughter to the entire town of Lucca and inspires Franco to live again. But with the farm failing to produce quality grapes and the looming rise of fascism in Italy, neither the fields nor young love may be able to bloom in Lucca. This novel throws emotional punches from the beginning. The WWI scenes that comprise the story’s first part are well handled, and it’s heartbreaking to read about Franco being guilt-tripped by his family into fighting a war he doesn’t believe in. While the rest of the novel focuses on the romance and domestic drama, the characters are likeable and developed enough to make these moments as compelling as the war scenes. Readers will easily find themselves rooting for Franco and Isabella and for the farmyard to produce a successful wine. Happily, the religious message of overcoming hardship and seeking forgiveness through faith fits well with Franco’s character arc and doesn’t feel forced upon readers. This story emphasizes the consequences of politics on normal people, an aspect that is highly refreshing. The characters overcome financial difficulties, clashes of opinion, and even false imprisonment, all told through clear and simple prose. On the down side, the exposition about Italy’s political situation, although well-researched, is mostly handled through lengthy explanatory dialogue, which drastically slows an otherwise exciting story. Also, the fascist leader Mussolini only makes two short cameo appearances; more scenes featuring him could have avoided the clunky exposition. This aside, The Walls of Lucca is a tender, suspenseful, and touching story sure to please fans of romance, political stories or historical novels.